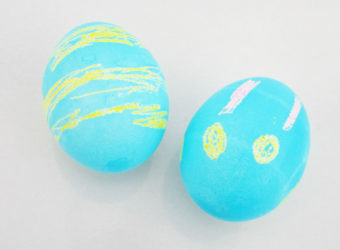 You can use rubber bands to add interest to dip dye eggs at Easter. 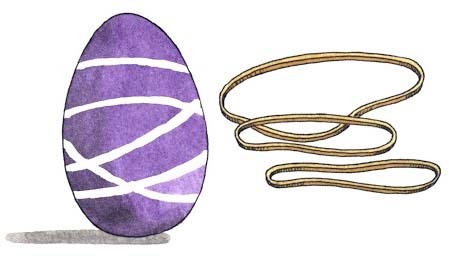 Wrap an egg (hard boiled or blown out) with rubber bands before lowering it into the dye. Make sure the bands aren’t too tight or your egg will crack! When you take off the rubber bands, you will find some extra special designs. 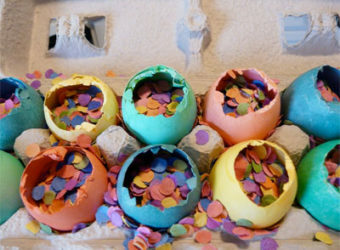 Note: If you want to keep your artistic eggs around for a while, it is best to use blown, rather than boiled, eggs. To do this, hold the egg firmly but gently and with a large needle pierce a hole into each end, making one hole larger than the other. Push the needle through both holes to break the yolk inside. Now, blow into the small hole and force the contents out of the large hole into a bowl until the egg is empty. 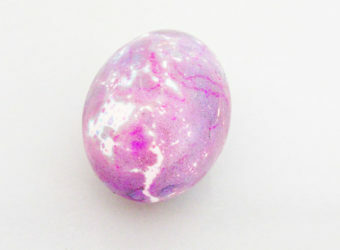 Rinse the egg, dry it and squeeze some white glue on the holes to strengthen the egg. All you need to do is combine the following ingredients in a container and let the mixture cool. 1 cup hot water. I used boiling water from the kettle. 1 teaspoon vinegar. A little more is fine. So is a little less. 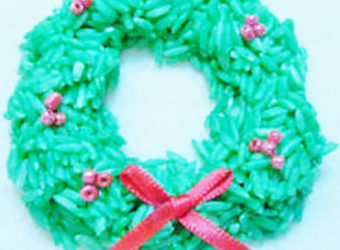 10 to 20 drops food colouring. The more you squeeze, the more intense the shade.